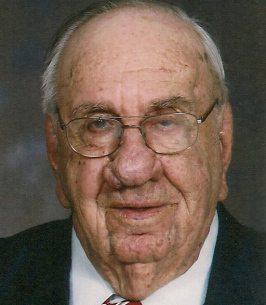 Norman Eggert Service Details - Seaforth, Ontario | McGlynn Family Funeral Home Ltd.
Norman Charles Eggert passed away peacefully at Seaforth Community Hospital, on Monday, January 14, 2019. In his 92 years among us, Norman lived his life with love for family, devotion to faith and his incredible memory for names, dates and places made him a valuable source of family and community history. Norm will be lovingly remembered by his wife Laura (née Jackson ) with whom he shared 69 years of married life, and their children Carole Eggert (George Hopf) of Stratford, DJ Eggert of Bayfield, Lorna Eggert (Mark Knechtel) of London and Susanne (Stephan) Evanitski of Keswick. Fond memories of a special grandpa remain with grandchildren Ryann, Ethan and Lauren Evanitski. Norm will also be remembered by siblings-in-law Grace McNichol, Wilfred and Peggy Jackson, Harold Jackson and many nieces, nephews and friends. In faith, we trust that Norman’s spirit is now reunited in eternal life with his parents Charles and Ida (née Hartmier) Eggert, his sister and brother-in-law Della and Irvin Rock, siblings-in-law Mary and Ernie Whitehouse, John and Deanna Jackson and Aubrey McNichol. On behalf of all his neighbours & friends in Sunset Estates where Norm & Laura spent many a summer we wish to express our deepest sympathies & condolences to the family. Norm was a fixture at the lake & I learned one important thing from Norm, farmer's never pay for dirt, you just move it from one location to another when needed. Good advice when you are trying to be a good gardener. George Darling past president of the Association. We are friends of Carole and George from Auburn Riverside Retreat. Our son, Nathaniel is Carole and George's neighbour. We send our deepest and most heartfelt sympathy to Carole, George and Carole's family. Although we have never met Mr. Eggert, we know that he must have been an incredible man to have raised such an incredible, caring and loving daughter, Carole. Once again we extend our condolences and are sending our blessingsand prayers to all. Darlene, Doug and Nathaniel Riddoch. Norm was a great neighbour for many years. His garden tiller continues to get regular use.Thinking of you all. To Aunt Carole and Uncle George - Sending our sincere condolences. May all of the love you receive from others give you strength in these difficult times.